What Do Modern Dog Parents Do On National Joke Day? Tell dog jokes of course! Here is a list of my Top 21! Add yours to the comment section below and let the laughter begin! Read More about What Do Modern Dog Parents Do On National Joke Day? Have you ever worried that sleeping with your dog or sharing some cuddle time with your puppy is against all the training rules? Are you one of the multitudes taught to believe that inviting your otherwise adoring, sweet, innocent dog or puppy onto your lap will turn him into Kujo? Do you have a family member, convinced by some celebrity trainer, who fills you with guilt each time you pat the bed sheets or lift your baby up for a snuggle? Do. This. Now! Call your dog or puppy over, lift him gently onto your lap (offering him a bone if he’s nippy) and take three deep breaths. Now repeat after me: It’s ok to be loving, it’s ok to be loving, it’s ok to be loving. Read More about Will Sleeping with Your Dog Make Him Aggressive? You may wonder, what the two have common? The answer is loads, at least from your dog’s paws. Leash aggression, while appearing defensive: “My dog is a bully,” is most often a reaction to fear. A dog who may seem ferocious is just as likely to be lashing out because he’s being dragged into another dog’s personal space, unable to retreat. Does your dog pace when you reach for the car keys, rip a few cushions while you’re out, or jump all over you upon re-entry? How about your walks? Is it really your dog who takes you for a walk? Does he drag you along or launch into aggressive dramas when something passes by or approaches you? If you’re embarrassed by your dog’s unsettled and wild behavior, remember, you’re not alone. Separation anxiety and leash aggression are the #1 and #2 problems of the 21st century (according to me). While housebreaking and jumping topped the list for a decade, they’ve taken a backseat. Why? Your Dog’s Playdate With His New Farm Friends — 6 Steps to Condition Your Dog To Big Animals! July 12th was National Cow day: How did you celebrate it? I may be a dog expert but the cow truly calls to me. Whether I’m taking a dog to visit a local herd or passing a farm along the highway I aways reflect upon the cow’s peaceful nature. I envision them during my deep breathing exercises. To me, they are calm, patient, yet mindfully unyielding. But dogs aren’t always on the same page. Calm is not a word I’d use to describe most dogs facing up to a large, hooved animals. Read More about Your Dog’s Playdate With His New Farm Friends — 6 Steps to Condition Your Dog To Big Animals! Dogs love to dig a lot like toddlers love to throw things. It's a great release. It's an accomplishment. And, for dogs anyway, it creates a wondrously cool resting spot. If digging's got you down, remember: all is not lost. While you can't eliminate the thrill of digging altogether, there are many things you can do about it. First, meet George - the Got Mud dog. He's my client's dog, and he wants for nothing. His family dotes on him morning and night. He gets the best food, a storage bin of toys, and his own pool. In my last post, I explained why any “training technique” that scares your dog isn’t good. Fear is a terrifying teacher. Poking, hitting, shocking — these are things bullies do. I’ve said it before, and I’ll say it again: love your dog, don’t bully him. You want a well-mannered dog. Really you do. But you worry that dog training will hurt the loving bond you share. Even the act of securing a leash and forcing your dog to walk in step feels cruel and restrictive. Dog training is okay for dogs but not for your baby. Now, however, your precious baby has a few bad habits - like shredding the couch when you leave, barking every time someone walks by, or jumping on visitors. What started as amusing has become annoying. 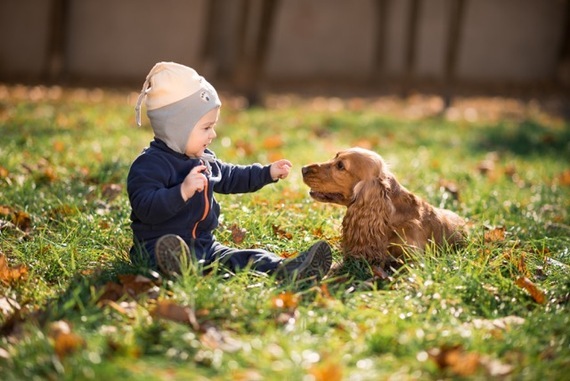 Last week, Quebec welcomed pets into the circle of “sentient” beings by granting them many of the same rights as children in the eyes of the law. The legislation, hailed as the “Animals are Not Things Manifesto“ lifts the legal status of specific animals from mere property, i.e. inanimate objects like toaster ovens and iPhones that can be manipulated any which way, to sensitive, emotional beings that require nurturing and respect. Earlier this year, researchers gathered at the Max Planck Institute in Germany to study the eyes of 90 mammals in the hope of finding a light-sensitive molecule called cryptochrome 1a. Last week, I posted a piece about reclassifying dogs in America as sentient beings rather than mere property. Many comments blasted my suggestion: treat dogs like children? That’s ridiculous. I openly call my dogs my babies. I think of them as family. Each one of my pets - from the dogs and cats to the birds, rodents and ever-beloved lizard, Vegas - is cared for and treated like an individual in my home.